At this year's Convention we had an audience of over 70 who enjoyed the trade stands and listened to our four excellent speakers. 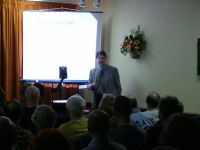 Our first speaker was Dr Francisco Diego – A Senior Research Fellow at University College, London. He was accompanied by Sally Price and her son Tom who gave us a talk called "The Ultimate Time Line" This talk was a simple visual effect with a rope 14 metres long representing the time line of the history of the universe. Tom had the job of attaching various objects to represent the big bang, star formation etc onto the time line. The message the talk was making was that even though the universe has been in existence for a long time the actual time our earth has been in existence is very short time. The rope didn't have a lot on it except for the last metre where there was not enough room to fit the objects onto the rope. Dr de Grijs – A Senior Researcher at Wolfson College, Cambridge University gave us a talk entitled "The Formation of Star Clusters". 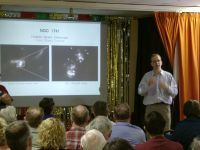 The talk was a review of the amazing results obtained with the Hubble Space Telescope over the past few years, with a particular focus on what they have been able to learn about the formation of star clusters in the Large Magellanic Cloud. Most stars develop in clusters but clusters collide and some stars are thrown out of the parent to go on their own voyage through space. Most single stars we see in the night sky were originally born in clusters. 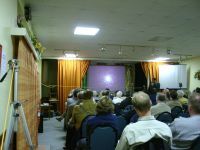 The first afternoon talk was by Dr Bob Lambourne – Head of the Open University's Physics and Astronomy Department and was entitled "Faster Than Light". This talk was about the studies of the speed of light, space time wormholes, cosmic inflation and other time distorting facts. 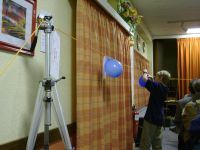 He also showed us how to create our own faster than the speed of light experiment. Get two books and place them back to back, now slide one over the other in a guillotine action. If you have the angle between the two books narrow enough, the speed will be faster than the speed of light. 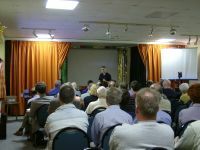 Our last talk was by Marcus Chown – Writer and Cosmology Consultant to New Scientist. His talk was called "The Universe Next Door" and put a different slant on our thinking of other universes. His thinking is that there are numerous parallel universes, each different. In one you weren't born, another you don't have the same parents etc. It complimented the other talks made during the day.